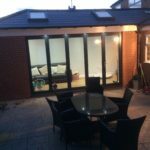 Each garage conversion is a different size and specification therefore it is impossible to give an accurate quotation without visiting the property and running through the specification in detail. A basic garage conversion is in the region of £8500 +VAT for a single straightforward garage and can reach a higher level for a very large conversion. Please get in touch to arrange a free quote.